An outdoor ski village in Sheffield has been damaged by a third fire in three weeks. 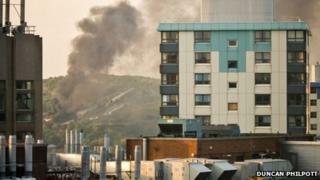 South Yorkshire Fire and Rescue was called to the Ski Village on Vale Road at about 19:50 BST on Monday. The fire, which was on the small ski slope, is thought to have been started deliberately. Insp Simon Leake of South Yorkshire Police said criminals felt it was "open season" to target the ski village. "Since the main fire [three weeks ago] we have had a number of criminal offences at the Ski Village," Insp Leake said. "This includes people trying to steal the matting and other fixtures within the site." Investigations are continuing into the cause of the first fire which destroyed the main building on 29 April. On 1 May, another fire, believed to have been started deliberately, damaged the ski lift. Vicky Lloyd, general manager, said up to 50 staff were now looking for work. "Unfortunately because of the [first] main fire, all the staff were made redundant," Ms Lloyd said. "The indoor family entertainment business - bowling alley, bar and play area - has obviously now been destroyed. Now that is gone, we won't be running the skiing side of things." Norman Gill, head coach of Sheffield Sharks ski club, has been based at the Ski Village since it opened in 1988. He said "mindless vandals" had persistently targeted the site. South Yorkshire Police said arrests had been made and patrol activity in the area had been increased. "The Ski Village is a vast complex which appears to have attracted criminals who feel that it is open season to steal," Insp Leake said. In a separate incident in March 2011, the adventure playground was destroyed in a suspected arson attack.